When cold weather arrives, it’s nice to enjoy the ambience of a crackling fire. Whether you’re heating your home or fueling a backyard fire pit, make the most of the firewood you select for burning. By seasoning and storing wood properly, you’ll have wood that burns cleaner, produces less smoke and creosote and yields more heat more efficiently. When wood is cut, it’s green and has a water content of 60 percent or more. Green or unseasoned wood is hard to ignite, smolders, burns poorly and doesn’t produce heat. Unseasoned wood also contributes more to creosote accumulation in the flue. 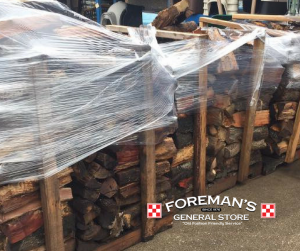 Visit us today at Foreman’s for the best quality seasoned firewood. Stock up today! This entry was posted on Tuesday, January 22nd, 2019 at 10:19 am	and is filed under News & Updates. You can follow any responses to this entry through the RSS 2.0 feed. Both comments and pings are currently closed.